The beauty of Planetary Gemology and the power of Gemstones are such that it focuses on solutions regardless of the individual’s race, religion, culture, social status or financial status or position. This magical science is all giving provided it is implemented correctly with real Jyotish Gemstones. – They are real Jyotish Gemstones. – They are indicated and advised after horoscope analysis. – Errors common in Gem Therapy are avoided. The Violet Blue semi precious Gemstone that delivers best results as an alternative to the blue sapphire/ Neelam is the Iolite. Also known as kaka neeli in Hindi this powerful gemstone is called as Shani Priya (Dear to Lord Shani) in the sacred texts and is supposed to be the Gemstone of the wife of Lord Shani. In many instances we have seen this gemstone deliver even more powerful results than the Blue Sapphire itself. As it is a strong Gemstone it should be worn only after a thorough Astrological analysis. The Iolite Gemstone has many benefits and should be seriously considered if one cannot afford a Blue Sapphire. Featured today is an Oval Shaped Iolite in a silver pendant. The first thing to notice is the pure colour which is classified as Royal Violetish Blue. Beautiful, attractive deep colour with high saturation. Calibrated (cut as per specific symmetric dimensions) 10*12mm Iolite with exceptional clarity of 95% and above. This clarity level in an untreated gemstone is very rare. 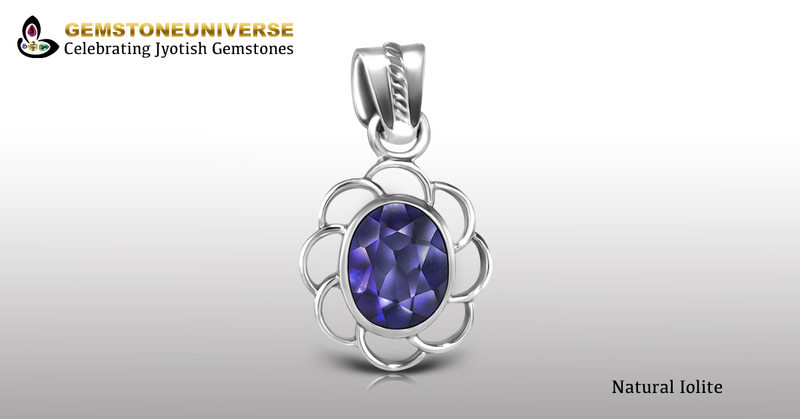 The Iolite Gemstone is bright, beautiful, lustrous and full of life. The deep violet of the iolite complements and contrasts well against the silvery white metal to produce not only a perfect jewellery piece but a true Jyotish Gemstone talisman that delivers results only Jyotish Gemstones are capable of. Comments: Thank You dear patron for your gracious testimonial.